Just being able to replicate computer designs nearly exactly on copper or brass is pretty exciting on its own. But using my trusty pasta machine as a printing press worked just as well as I'd been hoping. So neat! You might wonder what the point is of printing a design on a laser printer only to transfer it to metal and then print it by hand. Well, I'm a process junkie, so my first answer is "It's just fun, OK?!" But there are some other reasons. The texture of this kind of print is just different--the metal bites into the paper a bit. There are opportunities to incorporate artsy layering of printed textures by etching a combination of computer designs and designs carved by hand. And if I wanted to, I could use fluorescent inks, glitter-laden inks, or play with inking with multiple colors for a handmade, one-of-a-kind print. All things you can't get from a standard laser printer. 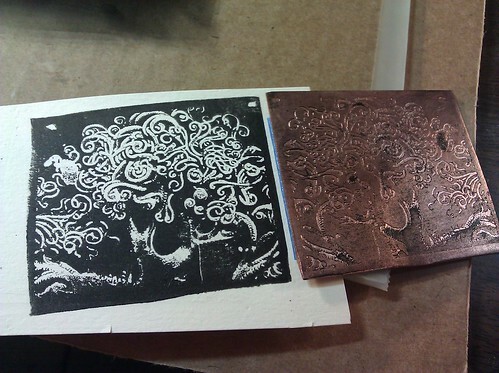 Then, when I'm done playing with printmaking, I could turn the copper into some sort of jewelry! I feel like I suddenly have a whole new world of design and illustration at my disposal. Right now I'm wondering how to combine public domain medieval woodblocks with fractals and abstract shapes. What do you want to see me etch?